Aw, nuts! I’m talking spruce nuts, of course. The scrumptious seeds inside a spruce cone are my favorite things to eat. But this year they’re hard to find. Good thing there is yummy fungus among us! Brrr . . . feel that chill in the air? Winter is just around the corner. For some animals, that means it’s time to curl up somewhere cozy for a months-long snooze. But I’m a red squirrel. And red squirrels don’t hibernate. We have to store enough food to last until spring. Usually, I spend winter snacking on the seeds I pry out of spruce cones. In a good year, I collect as many as 20,000 cones during a few weeks in fall. I tuck them away inside a cool, damp storage hole that I use as my winter pantry. But other years, the trees don’t produce many cones. That’s when I turn my attention to tasty treats found right on the forest floor: mushrooms! Big ones, small ones–even some mushrooms that would make a person sick. They’re all part of my fall fungus feast. Unlike a cone full of seeds, a fresh mushroom won’t last the winter. It will rot and turn yucky long before spring. So what’s a hungry squirrel to do? When life gives me mushrooms, I make mushroom jerky! First, I find a tasty-looking mushroom. 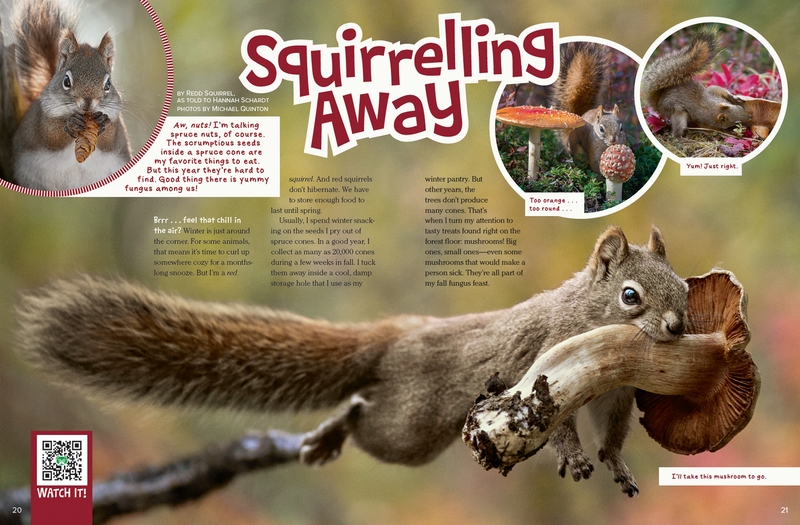 That’s not hard–the cool forests where we red squirrels live are full of them. (I live in Alaska, but my buddies are found in forests throughout much of the United States and Canada.) I take a little nibble. If the ‘shroom passes the taste test, I chop down the whole thing. Who needs an ax when you’ve got chompers like mine? If the mushroom is too big, I might break it into smaller pieces. But usually I just drag the whole thing, stem and all, up the trunk of a nearby evergreen tree. That’s where things really get cooking–or drying, to be precise. I tuck the mushroom securely among the needles on a branch. Over the next few days, the dry air and warm sun take the moisture out of the meaty mushroom. The next time I come back–voilà!–mushroom jerky. I may steal a taste or two. But I tuck most of it away in my hidey hole. Flavorful fungus looks pretty good now. But imagine how much better it will be as a midwinter meal! 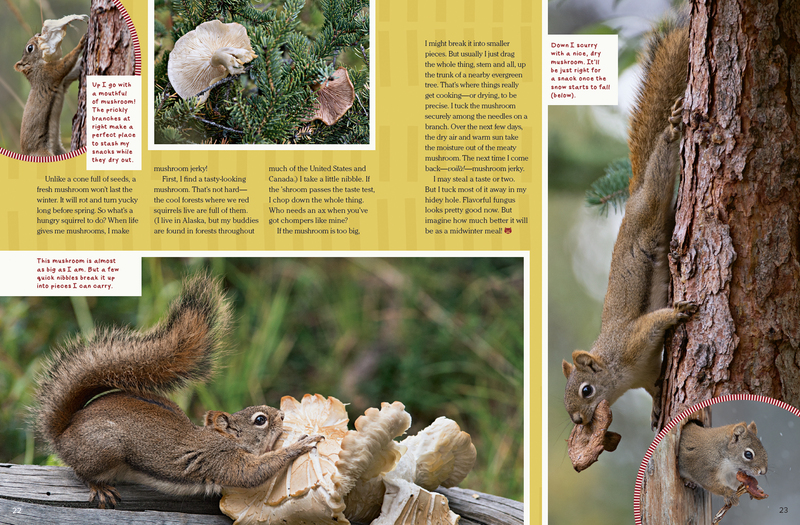 “Squirrelling Away” originally appeared in the October 2016 issue of Ranger Rick magazine.